So there I was walking through Terminal D of the DFW Airport close to midnight and all I wanted to do is get to my car so I could go home. Then, out of the corner of my eye, I see this – another 11th Screen (IOOH) example – a large display that looked like it was just inviting a touch. So, of course, I stopped, got my trusty flip cam out, and started to poke around on it. Let’s dust the scorecard off and put ‘er to the test. Purpose – This is simply an interactive information kiosk that just happens to be an 80″+ touch screen. It’s designed solely to give travelers all of the essential information they need while they’re in the terminal – places to eat, where to shop, where to get your shoes shined, where the restrooms are, flight information – anything any traveler needs to know. Right at their fingertips. On an 80″+ touch screen. Mission accomplished. Drama – When does an 80″+ touch screen not create a sense of drama? For the experience, I think it’s a bit like using a bazooka when you need a pea shooter. But the size is the thing that tipped me off to its interactivity. 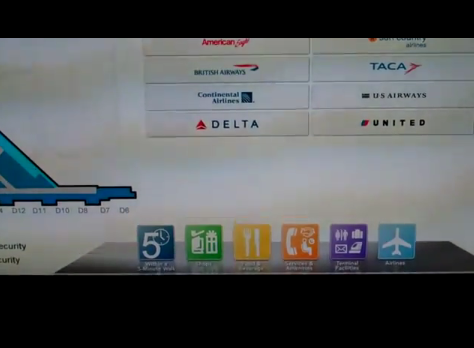 Ironically, I think it’s too well designed because the screen and structure fit right in to everything else in the terminal, so one could easily pass right by it thinking it’s just a big sign. And that’s the biggest problem. There was no clear call-to-action on the screen, nothing really that says, “hey there, why don’t you stop and touch this screen because I’ll give you some great information.” Instead, it’s just a silent 80″+ screen. Usability – This is a simple experience so it’s usable. Or maybe it’s the other way around? In any case, this was an easy experience to navigate through. It wasn’t deep with content, so after you drill down a couple of times, you’ve hit the end of the path. But the GUI is laid out in a way that allows you to get to other pieces of content in a single press. As far as the functionality goes, I would underwhelmed with this experience. I wanted more and as you can see in the video, I expected it to function different than it actually did. With a large touch screen like this, I expect the functionality to be just as big. Not complex or obnoxious, but in some way commiserate with the size of the screen. Interactivity – This is a single touch, single user touch screen experience. For a screen this big, they could have planned for multi-user interaction and created a rich experience. As it stands – in its current state – it’s as basic as you can get. The response and its functionality, after you press one of the buttons, is not distinct enough to let you know that something has happened. So, while the screen is responsive to your touch, the action (or seeming lack thereof) makes you think that it doesn’t work. Information – To me, this succeeds at 1.0 information, but fails miserably at 2.0 information. Yes, it contains all of the information that it promises. But it’s base-level information – the name, the place, and the location. This experience could be made instantly better by integrating LBS (Foursquare, Gowalla) and/or consumer reviews/comments (Yelp?). Our friends at LocaModa would have a field day with this experience. Personalization – There was no personalization in this experience. I think a social component – check-ins, reviews, comments – could add a welcome level of personalization to this. It would be relatively low user commitment, especially compared to the high level of benefit this sort of information would provide. Overall, the lack of social integration has been a huge theme in these touch screen experiences over the last year. I am starting to feel like single-source information is not good enough anymore. But these are the things I pay attention to. I’m not sure that the average consumer – or traveler in this case – cares so much about it. Here’s the thing though – when their first impression includes social content, they feel like this is just another extension of what they’re used to when they use their computers or their phones. When it doesn’t include social content, I think we run the risk of not providing the type of value they need (based on their not-yet-completely-understood expectation). More than that, though – when you’re going to do anything with an 80″+ touch screen, the experience better be 80″+. This entry was posted in Digital Signage, Emerging Technology, Out & About and tagged 11th Screen, DFW Airport, Digital Signage, Four Square, Gowalla, LBS, Out & About, touch screen, Yelp on 03/17/2011 by Mike Cearley. Location-based services (LBS) – like Foursquare, Gowalla, and Yelp – made a big splash last year as a fairly successful, yet niche, mobile tactic for brands aiming to reach consumers in the real-world. They are great platforms for rewarding loyalty, real-time consumer reviews & tips, and for those who like such a thing, keeping track of your friends/family. I’ve “played” Foursquare consistently for a year now and dabbled in the others – Gowalla, Yelp, Loopt, SCVNGR. There’s interesting potential with this sort of technology, particularly when integrated with placed-based signage. But as I’ve wandered over the last year, I’m left wondering if these technologies will stick and ultimately reach the average consumer. And more than that, what it will take for them to reach that point? Here are my chronicles. I checked into my train station the other night. It was my 100th check-in and as a result, I received a “Century Club” badge. I also received a customized message – something to the effect, “they should put your name up on the wall for frequenting so often.” Or something. First thought: cool, I got another badge. Second thought: ugh, I don’t get anything other than this message. The badge wasn’t enough. I wanted a free 30-day pass. A free ride. Some sort of discount, at least. I’d even take my name scrolling across the digital ticker at the station. But then, that would get old, and I’d want something else, something of value. The fact that these technologies fit into our regular, everyday life is one barrier that they don’t have to overcome. The check-in couldn’t be easier. But the big barrier lies in the value. As with any emerging technology, there’s a novelty period where it can get by on the technology alone. But there quickly comes a point to where it loses the novel factor, and in order for it to become sustainable and gain scale, it has to create some sort of value. And this is what I’m feeling right now. Little to no value. It’s interesting because my expectations have changed in a very short amount of time. And if mine – an early adopter/user, not the “average” consumer – have changed, what will it take to reach the average consumer? And become part of their daily lives? The digital signage industry, and the places and things around us, can certainly help to create a sense of value. Stephen Randall and LocaModa have made a living targeting this very combination. Stephen’s specific take on this is that the value lies in the 3 Fs: Fun, fame, and fortune. These are the keys that motivate consumers to interact with LBS, and digital signage is a perfect platform to maximize their effect. Everyone likes to see their name “in lights” (fame) and by nature, most of these technologies are game-like and fun. The key is “fortune.” Value. Is virtual currency enough, even when you see yourself in the middle of a Times Square billboard? I was willing to accept my name scrolling on the train station ticker. But I’m still left empty. This entry was posted in Digital Signage, Emerging Technology, Marketing, Mobile and tagged Digital Signage, Four Square, Gowalla, LBS, LocaModa, location-based advertising, Loopt, Mobile, SCVNGR, Yelp on 02/18/2011 by Mike Cearley. Panel 2 of the day – this should be interesting. Again – best part is the questions at the end! Maybe I’ll start just recapping questions? He’s geting into case studies, starting with Starbucks/FourSquare. Another case study – Market Fair Mall in New Jersey – mayors got special parking spots (primo) at the mall parking lot. Nice. 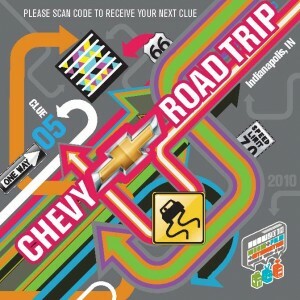 Gowalla – he’s focusing on our Chevrolet/SXSW case study! Specifically, talking about our free rides to/from the airport when people checked into the airport on Gowalla. Very nice. FB Places – Are they going to become the Walmart of geo-location? No rewards, incentives, gaming element YET. Scvngr – involves skill along with just basic checking in b/c it’s a real-life scavenger hunt. Now, out of geo-location, he’s going to talk about blogging platforms. Alot of people are blogging. Alot of people are reading blogs. What’s the new way to blog? Introducing Tumblr and Posterous. Both are good platforms. Stronger social aspect – allows re-blogging and “liking.” Bloggers can post from email/SMS. The tools he’s going to focus on: video, social media management, group buying. Video – users watch an average of 15 hours/month of online video. Ooh – learned something new – you can edit YouTube videos with Tube Chop. Where have I been?! Alot of people haven’t developed a social video strategy, much less a live video strategy (using tools like UStream). Effective videos sell and entertain. Show of hands again – how many people use social media management tools to listen? About 50% of the room raised hands. I want to look into Sprout Social. Tools like this are important to understand what’s being said about you/your brand, and gives you better insight as to how to respond/engage. Also allows for syndication of content. Group buying now – he’s talking Groupon and the like. Yipit – look into this. This company aggregates all of these deals into 1 place. Group buying is all about the DEAL (D = daily, E = experience, A = awareness, L = local). One of the unique benefits of group buying is that it enables conversation to extend into people’s own social communities. Questions – what do you think is going to be the next Twitter or Facebook? Nick – 3 pillars right now – Facebook, YouTube, Twitter. What’s next – Scvngr, FourSquare – something related to mobile because people have their mobile phone in their pocket every day, all the time. He talked about Facetime on iPhone 4 and the power of using video, real-time services. Jason – agree with everything Nick said, but he extends it into Augmented Reality. Walking down the street, you can see deals, information on businesses you’re passing (nice that he mentioned this, although he didn’t specifically say Out-of-Home or Interactive Out-of-Home). Also mentioned gaming. Nick – a big challenge is legal. A lot of these initiatives haven’t ever been done before so that might cause trepidation. Question – hard time convincing marketing executives that when consumers are engaged in these types of engagements, they’re skeptical that the brand should be “involved” in the space. What’s the opportunity? Nick – any social network out there is NOT a marketing platform. We’re there to talk to our friends/communities. He offered up some research, but didn’t really answer the question. Jason – people are receptive to hearing from brands. There’s a balance between commercial content and user-generated content. It’s about having the right metrics to show how far you can push this. This entry was posted in Uncategorized and tagged Augmented Reality, Conferences, Four Square, Gowalla, Groupon, PR News Digital PR Summit, Tube Chop, Yipit, YouTube on 10/06/2010 by Mike Cearley. Today marks a milestone of accomplishment here on this blog – for the first time ever, I have blogged every day this week! I hope everyone’s enjoyed the posts. I have my own opinions on blogging and everything behind it and at the end of the day, I’m just another voice in the sea of opinions that now have access to be heard. I don’t really like to write here unless I feel like my perspective is beneficial (and no, I don’t feel like it’s beneficial on everything, and I’m sure I’ve missed the mark here, on a number of occasions) – this week, I saw many different things that I really wanted to write about and share. So, today, I hope to close the week out strong, at least semi-strong. The site that it sends you back to is nothing impressive, but it is driving consumers deeper into the brand. And I still maintain that as long as you’re using print, why not include tags like this? It just makes all the sense in the world. I love the fact that they’ve chosen MS Tags, the scanning code/technology that I believe is the easiest, device-agnostic, user-friendly to use. 2. Why Environmental Activists Embrace Social Media – this article specifically talks about PR and social media and BP being caught with their pants down. Obviously very interesting for me to read, being that I work for the largest PR company in the world. Here’s what I say to any company about social media (in addition to the points made in this article that I agree with) – you need to create a baseline of a presence, regardless of the climate of the industry and what your competitors are doing. In other words, start with something – a blog, for instance – that allows you to get your voice out there and establish a baseline of presence and credibility. That way, god forbid something happens and you need to respond to crisis (just as BP did), you’re not forced to go 0-60 in a day. Even now, there are many companies who don’t want to get involved with social media unless they’re “forced” to (ie – when they need to deal with a crisis). It’s hard to react to something critical when you haven’t even defined your presence. And it takes time. 3. The Ultimate Guide to Rapper Names (Infographic) – I’m a visual person. I love infographics. As you can see (follow the link to see infographic), “Lil”, names centered around “Royalty” and “Criminals” are some of the most popular. What a world we live in. 4. Online Retailers’ $44 Billion Customer Experience Problem (Another Infographic) – pretty cool stuff shown here. The point is (aside from poor design/workflow in online shopping experiences) – many people don’t like to bother with going in stores. They’d rather do it online, in the convenience of their own surroundings. I’d love to see something like this showing the impact on digital/interactive Out of Home that allows consumers to shop outside of their home, without going into the store. We’ll get there. Still, the digital shopping experience can’t be ignored. (Images look better on the Fast Company site vs. here, so check it out there). “Uh-huh” – “Heroes” Creator Tim Kring Looks to the Future – I found this article fascinating. #1 – I like the term “transmedia” which as he puts it, is a “fancy word at this point for a simple concept: telling stories across multiple platforms.” What I always talk about!! And #2 – what I like even more, he follows that up with, “It will be a short-lived word, because it’ll just become the norm – the trans will stop and it’ll just be media”. Wow, this dude is dialed in and he gets it on a level that I believe few people do. His ideas are no doubt cool. And although I didn’t watch every episode of Heroes and follow the different stories across all of the channels, it was a groundbreaking way to extend and evolve a story across multiple platforms. (Just as Lost did as well). #3 – what really got me thinking is, in agencies, particularly new agencies of the future – the gold might be in finding storytellers of the filmmaking nature vs. “creatives” specializing in design or copywriting. Hmm. “Duh” – Technology Changes the Face of Politicking – I don’t know if this is a “duh,” really. But I don’t know that I really get the level of the true impact that politicians think that geo-location services like Gowalla actually make. I like Gowalla and have worked with them multiple times before, and I’m happy that they’re exploring a new arena, but I don’t know how this is going to be the next social media “game changer.” Seems a little strong to me. Would love to hear your thoughts, though, if you feel differently. So, there you go. Closing out the week (semi-) strong. Happy weekend, everyone! This entry was posted in Digital Signage, Friday 4-1-1 and tagged Digital Out of Home, Digital Signage, Fast Company, Ford, Friday 4-1-1, Gowalla, Heroes, infographics, Interactive Out of Home, MS Tags on 09/24/2010 by Mike Cearley. 1. Facebook Places Propels SCVNGR to 100,000 Downloads in 48 Hours – reality check, first of all – the “general” consumer doesn’t use geo-location apps like FourSquare, much less a new app like SCVNGR. The penetration numbers for “digital” users who use geo-location apps are low (~4% according to Forrester). However, I believe there is loads of potential for geo-location apps like FourSquare, Gowalla, FB Places, and SCVNGR (and the others). These apps really enable a feature that I believe is core to a brand’s success in the new “Out of Home” space – reaching consumers where they are (out of home) and driving deep(er) engagement with the brand. There are few brands who have really figured out how best to do this, but there are many who are experimenting. 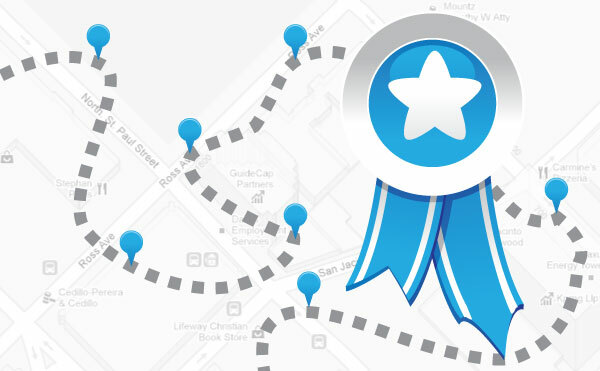 As far as SCVNGR goes, their platform is really based on the idea of a Scavenger Hunt – users go around to different places (called “Treks”), when there, they have to complete a challenge, get rewarded via points, and then ultimately get rewarded with badges. For brands, this platform is significant because it’s a built-out mobile platform, specifically intended to provide challenge-based scavenger hunt game-play experiences. Yes, you can pretty much do the same thing with FourSquare (you have to work through FourSquare) and Gowalla (users themselves can set up “trips”), but they weren’t built for this very thing (neither of them are based on “challenges”). In my opinion, it’s a better way to reward consumers who are loyal enough to your brand to go through a challenge-based scavenger hunt (again, outside of their home) vs. just checking in repeatedly at a single place. 2. Four Seasons Joins Geo-Social Gold Rush With California Campaign – I’ve put together a number of campaigns with Gowalla – it’s not the Austin-based connection that I am high on with them, it’s really the experience they provide vs. FourSquare. (In fairness, if I could put together any geo-location-based campaign, regardless of budget/time constraints, I would probably look at using both of them, but Gowalla is easier/more accommodating to work with. FourSquare has sheer numbers, Gowalla has a more engaging experience, particularly on the brand side, in my opinion.) So, it was nice to read about a brand like Four Seasons hopping on the geo-location bandwagon. Again, this is yet another example of a brand driving engagement with consumers while they’re out and about, going through their normal day-to-day activities. Who would have ever thought that just by “checking in” some place through your mobile phone, you could get rewarded with a hotel-stay voucher. 3. Toys “R” Us Unveils Multichannel Mobiel CRM Tactics – here’s my QR code example this week. Only problem with this is that it’s launching in Hong Kong only. At least right now. Solid concept though – targeted at their loyalty card holders, those loyal consumers can unlock exclusive content through these “R” (what Toys R Us is calling them) codes and from the sounds of it, with each scan, can earn more “loyalty” points, which is of benefit to them with real-world merchandise. QR codes are commonplace in that part of the world, so I suspect this is going to be widely used. Hopefully, the campaign will make its way here and even more hopefully, US consumers will actually know what to do when they see this weird code in front of them. 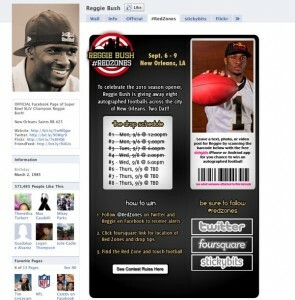 “Uh-huh” – Reggie Bush hit the Holy Grail by combining geo-location (FourSquare) with social media (Twitter/Facebook) and the real-world (with StickyBits). This is the perfect combination of driving Reggie Bush-brand engagement through the use of various mediums/channels, including a strong OOH play. 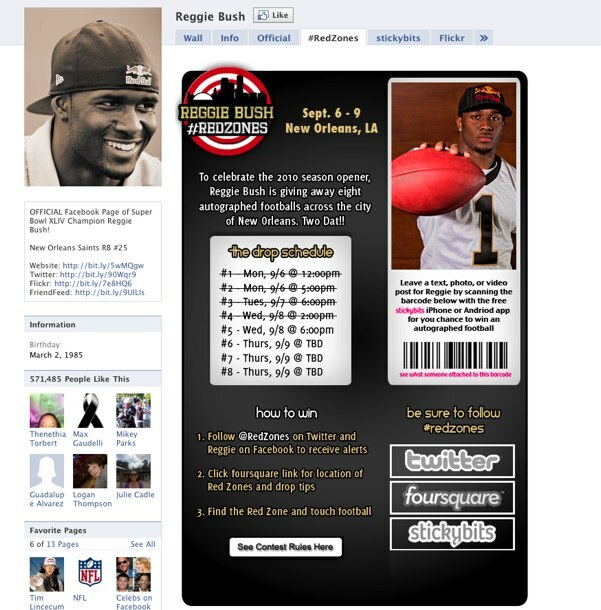 Basically, Reggie used FourSquare like a scavenger-hunt service (should have used SCVNGR!) so that fans could find autographed footballs around the city of New Orleans in anticipation of last night’s opening NFL game. They could then attach messages to StickyBits for Reggie. Great cross-channel program. Before I get into this week’s “Duh,” I’ll say this – I think that “OOH” as a media channel has changed drastically in the past few years. My definition of “OOH” is “anything that the user doesn’t have to own to have an experience with.” In these cases, a user needs a mobile phone, but the point in which that experience originates is always OOH and from something that they don’t need to own – checking in at a location doesn’t require you to own the location, using a QR code doesn’t require you to own the QR code, and even playing a game from a box of pasta doesn’t require you to necessarily own the box of pasta. Lines are certainly more grey than they used to be in terms of “OOH” and it’s in this grey area that I believe lives the 11th Screen. Now, my “Duh” – it’s not an example this week, it’s a piece of advice based on a few experiences that I’ve had this week. Slow down. Life and work move very fast and most often, we make decisions in split seconds. Those decisions can have a profound impact on other people and your own work (substitute “life” with “work” if you want to). There is nothing wrong with slowing down, taking a deep breath, having a think on it, and then moving forward. I hope you guys have a great weekend. Would love to hear anything you’ve got to say about any of this. Just shout! This entry was posted in Friday 4-1-1, Marketing and tagged 11th Screen, Augmented Reality, enabling technology, Four Square, Friday, Friday 4-1-1, Gowalla, Interactive Out of Home, IOOH, Mobile, OOH, Out of Home, QR Codes, Stickybits, Toys R Us, Twitter on 09/10/2010 by Mike Cearley. Life is becoming more and more interactive right in front of our eyes. Today’s installment brought to you through mobile interactivity. One of the most popular forms of mobile interaction, centered around our lives and connections, is geo-location based services like Gowalla and Foursquare. New to the game, both literally and figuratively, is Stickybits. As an example, think of a birthday card (which has a barcode). Instead of signing a long, drawn-out message on this birthday card, I can record a special video message and attach it to the card. Then, I can pass it around to others in the office for them to attach their special message to it. Then, when the recipient receives the card, they can scan the barcode and experience everyone’s messages. Cool, eh? Think now, of applying/using user reviews. If I want to see what others have said about a new pair of tennis shoes before I buy them, I can scan the barcode and see a list of user reviews, provided someone has started the “string.” If not, I can create the review myself and attach it to the code for others to see who come after me. There are cool things that you can do as the initiator of this string – you’re basically the moderator of all content posted thereafter. Anyone who contributes to the string can receive automatic updates and become even more involved in the (virtual) conversation. From a brand’s perspective, this should be really exciting. Any packaged good that they produce has a barcode. They can easily attach a brand message or a special call-to-action or exclusive content for all who come into contact with that product to experience. You want to attach a special message from a thought-leader, or an executive at the company? No problem. You want users to vote on a particular flavor of soda (Mountain Dew)? No problem. You want Tom Hanks to deliver a Forrest Gump-like anecdote on that box of chocolates? No problem. I talk often about the power of merging the offline with the online. It’s really what the 11th Screen is all about. This technology not only enables that real-time merging, but it provides connection, interactivity, and a little fun. This entry was posted in Emerging Technology, Marketing and tagged 11th Screen, Four Square, Gowalla, Interactive Out of Home, IOOH, Mobile, Stickybits on 06/07/2010 by Mike Cearley. I have finally been able to catch my breath from the SXSW trip enough to reflect on everything I observed and share it here. First of all, my perspective of SXSW is different than any other conference I’ve attended, just from the standpoint of how much work I was doing to make things happen for our client. It was, by far, the most intense, condensed (if that makes sense) working situation that I’ve been in with an agency. I liken it to my time working on films – in many respects it felt like film production. Late nights, early mornings, always on the run (and I emphasize run), going from one thing to the other so quickly that you’re just reacting. I like that kind of work, that kind of pace, that kind of “doing,” but it’s not something I could sustain at this time in my life. Short periods? Sure. Every day? No way. Anyway, my involvement at that level “behind the scenes” prohibited me from experiencing the conference in a way that I am accustom to. I didn’t go to any panels, I didn’t go to any parties, I didn’t spend time networking at length with people. It really was strictly business on behalf of FH & Chevy, not Mike or The 11th Screen. That said, I was involved enough in what was going on, specifically around the convention center, to come away with some good, pretty fair observations. 1. Value, value, value – it really does work. Brands can accomplish a lot and shift perceptions by providing value to people. To me, this is all about relevance. How are you, as a brand, communicating & engaging with your audience(s)? Are you engaging in a meaningful way? Is it mutually beneficial? Does it provide value? 2. Don’t talk to, talk with – it’s all about 2-way communication. Listen first. Then, talk. It’s so simple. It’s what we do in our normal, everyday, real-world lives. At least what we should be doing. Effective communication and engagement is not about talking to people, it’s about talking with people. Try this with your spouse, with your kids, with your co-workers, family members, friends – just talk with them. It’s a dialogue. A give and take. When you do this, you can both have productive, fulfilling conversations. Brands who do this, particularly in the social space, create advocates and build trust. Advocacy and trust are sustainable and those types of relationships don’t go away easy. 4. QR codes & LBS are a ways away from mass adoption – I think SXSW majorly failed at their attempt to introduce QR codes to the masses. They had a prime audience, one who could actually warm to the use of them, yet they failed to educate and create an easy experience with them. Their codes virtually went unused. By the time attendees came to our booth, no one knew what QR code reader to load on their phone and/or exactly what to expect from them. I think QR codes, specifically SXSW’s use of them, was the most overrated technological story that came out of the conference. Again, this is from my limited point of view. (I heard that Twitter’s announcement of their @Anywhere feature was less than stellar.) I just had such high hopes for the QR code story. 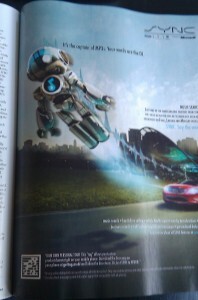 But QR codes aren’t the only emerging technology that is still immature over here. LBS, like Gowalla and/or FourSquare, are used consistently by such a small segment of people. But there is a huge group who have no idea what “LBS” stands for in this context, much less how to use them on their phone. There was a vast difference between the interactive attendee usage of Gowalla and the music attendee usage of Gowalla. I think a lot of this is attributed to the penetration (or lack thereof) of smart phones still in the US. The opportunity here is to continue to push these types of technologies – because I believe that they still have a life – and experiment with them in various ways. We’ve really only scratched the surface in how we can use them in relevant, meaningful ways on behalf of brands. 5. Last but certainly not least, I work with some amazing people. We were a relatively small team, but we are like family. Matt, Valerie, Cindy, Jodi, Marc, Herb, Rob, Miker, Jessica, Penny, Sarah B., Sarah F., Lane, Chris, Chrissie, Brad, Warren, Christian, designer Jessica, Matt W – you guys rock. I’d love to hear your thoughts on SXSW. Shout back. This entry was posted in Marketing and tagged 11th Screen, Four Square, Gowalla, LBS, QR Codes, SXSW 2010 on 03/24/2010 by Mike Cearley. Wow. I have been buried in work, specifically gearing up for SXSW – the premier interactive, film and music festival in the nation. Yes, I am a little partial because I’m from Austin (where it’s held) but anyone who’s anyone, particularly in the interactive world, attends. With its heavy technology focus, “trends” tend to appear here before they go mainstream. We have spent the last few months planning a huge integrated program for one of our clients, Chevy. And honestly, I couldn’t be more proud of everything we’ve done and are doing. Chevy has been great to work with and it is our expectation that we will enhance the SXSW experience for everyone. I won’t get much into all of our program right now, but suffice it to say, we have developed a heavy social + mobile + OOH program. Here, it’s the OOH program that I really want to focus on. 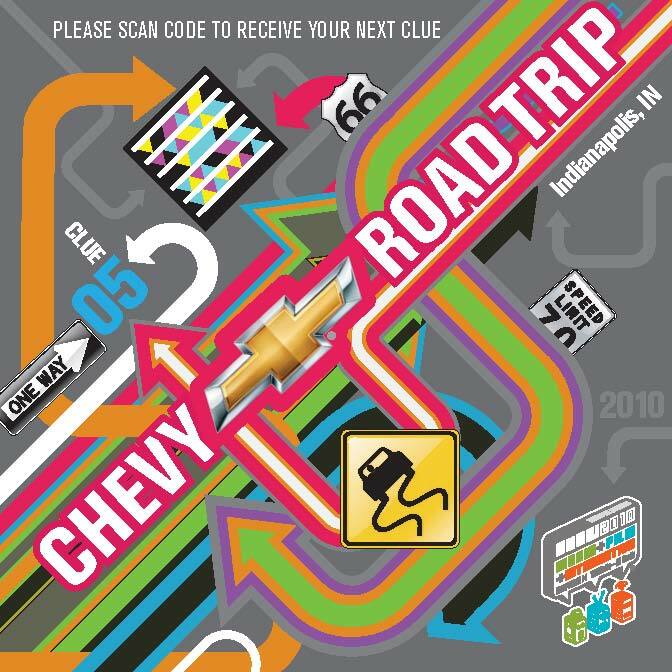 Yesterday, 8 teams of roadtrippers from across the nation (influential SM-types) set off, all in Chevy vehicles, en route to Austin, where they will all arrive on Thursday 3/11. Along the way, they are accomplishing “tasks” (which have been crowdsourced over the past month) and broadcasting them across the world wide web. In addition, they’re receiving clues that lead them from destination to destination. (It’s like the Amazing Race 2.0.) This is where we’ve introduced one of the OOH components. We’ve made postcards with QR Codes and MS Tags that have been/are being delivered to the teams’ various hotels. When they check-in at their hotels, they receive a package that contains these postcards, and when they interact with the postcards, they receive their next clue. Each team gets 1 QR Code postcard (that leads them to a Twitter account) and 1 MS Tag postcard (that generates an SMS). Since this is such a technology-rich conference, we really wanted to introduce these roadtrippers to different types of emerging technologies (they also receive a clue via “checking in” with Gowalla) before they arrived in Austin. We felt that it was the perfect way to set the stage for everything that they will experience in the days to come. More to come as we get closer to SXSW. If you’re interested, follow all of the action, from Chevy’s perspective here. This entry was posted in Emerging Technology, Marketing and tagged Gowalla, IOOH, Mobile, MS Tags, QR Codes, SXSW 2010 on 03/09/2010 by Mike Cearley.